For the base I used Worbla, but you can also use wonderflex (or other types of thermo plastic) or foam. I attached the edges on each other and shaped the Worbla by using hot water. The material will stick on each other by heating it up. With a soldering iron I added the edge on the crown. – To smooth out the crown I have sprayed spray putty on it, let it dry for a few hours and sanded it slightly. – I cast the gems on the crown with clear resin. I used a drop of translucent glass paint to color them and a base mold for resin which you can find in craft stores. – After the resin was fully hardened after a day, I glued mirror foil on the backside and then on the crown with super glue . I used air dry clay for adding/finishing the edges. 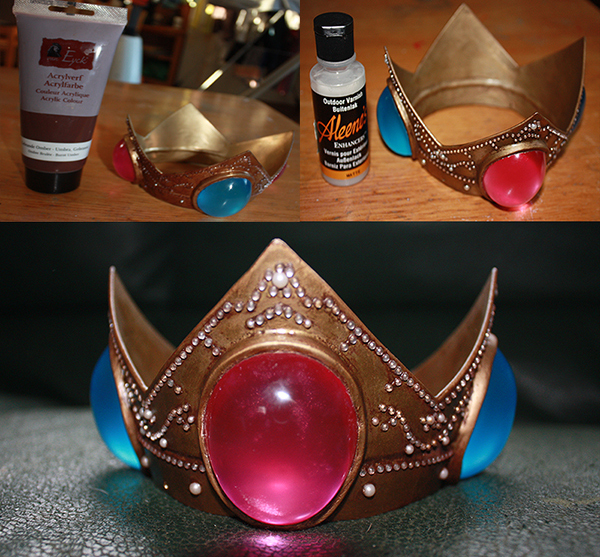 – I sealed the resin stones with masking tape and spray painted the crown gold and let it dry for a few hours. 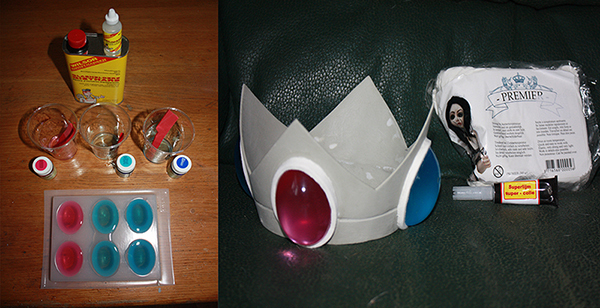 – I used very small sticker crystals and pearls so I didn’t need to use glue to put it on the crown. This is faster and saver to avoid glue being visible. – For the worn out look I used brown acrylic paint which I thinned out with water. I used a piece of cloth and rubbed it over the crown until the crown was fully covered. I used a clean cloth to rub off the paint, the paint will remain in the edges of all the details which gives the crown a more classic look. You can also use the dry brushing technique for this result. – For sealing everything I used 2 layers of matte varnish. – For being able to shape Worbla you can also use a heatgun or oven. – Be careful with the soldering iron, you can make holes in the material with it easily. – If there will be some paint on the resin stones, don’t worry you can get rid of it with acetone/ nailpolish remover. – Drill small holes in the crown to be able to sew the crown on a wig. Thanks again to Iloon for sharing this tutorial with us!